Whether you are organising a birthday, anniversary, reunion, meeting, school formal, exhibition, conference, Christmas party or presentation night our well appointed function rooms are the ideal place to celebrate your next special occasion. There are four venues which are available: A.H. (Pete) Rathjen Dining Room, Winning Post Dining Room, Boyo's Bar and Corporate Box. 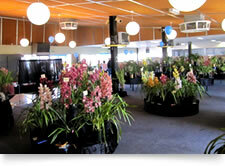 The A.H. (Pete) Rathjen Dining Room is ideal for large functions or exhibitions, with room for 400 people. 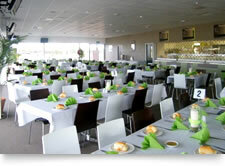 The facilities include a dance floor, separate bar and full professional kitchen. Video display equipment is also available. The jewell in the crown of the Shepparton Harness Racing Complex, the Winning Post Room is a state-of-the-art facility that provides racegoers with the best view of harness racing anywhere in the world. 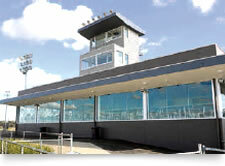 Situated just metres from the track, patrons can view high quality racing behind the expansive glassed viewing area. Enhancements of full TAB facilities, a boutique bar and a great bistro and toilets have to be seen to be believed. A disabled ramp entrance is another key feature of this great facility. 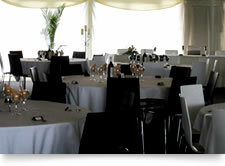 The Winning Post Complex is ideal for any function whether it be an engagement party, wedding, seminar or trade display. Hire rates are very reasonable for a complex of this standard. The facility has an On Premises Licence only, so no BYO alcohol is permitted. 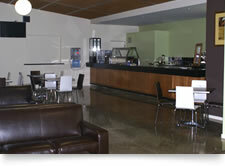 A recent addition to the facilities is Boyo’s Café Bar. Purposely designed to cater for the needs of those looking for fast service at reasonable prices Boyo’s Café Bar has quickly developed a reputation for its friendly atmosphere and comfortable amenities. 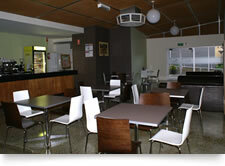 On race nights the café bar provides a variety of meals not exceeding $10, take away food as well as coffee and drinks. 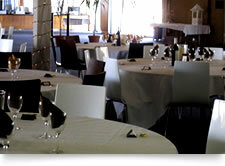 Boyo’s is also an ideal venue for small gatherings up to 70 people and is regularly booked for private party functions. 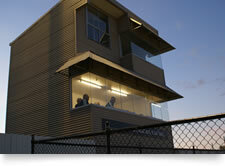 Another recent addition to the complex has been the development of the old judge’s box into a modern Corporate Box. This box presents the most amazing view of the track. The Corporate Box is so named to reflect the tremendous contribution that generations of the Cormican family have made to harness racing. The elevated Corporate Box is fitted with televisions and bar facilities. Gourmet food is available on request. 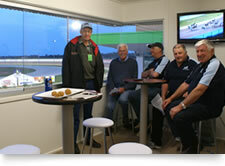 With a capacity of 15–20 people the Corporate box is an ideal facility to entertain guests or simply share a fantastic night of harness racing with your best mates. A nominal fee of $100, rents this box out at any race meeting. 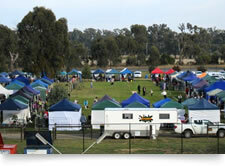 A feature of the Shepparton Harness Complex is the wide open spaces that also attracts a number of uses. 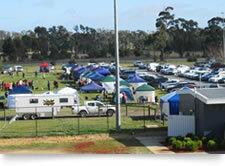 The significant grassed areas of the complex host a variety of users including dog shows, camp overs, rallies and trade displays. 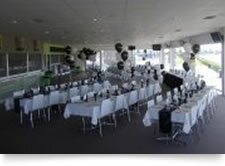 If you are planning a special event that requires open space then the Shepparton Harness Complex may suit your needs and is very affordable.